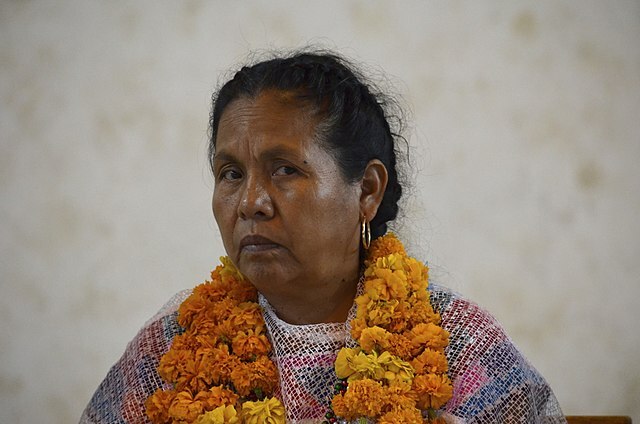 Mexico (OpenDemocracy) – “Mexico has been kidnapped by those in power, and with your help we’re going to get her back!” said María de Jesús Patricio at a political rally on 11 February. Her supporters filled the plaza outside the Palacio de Bellas Artes – a historic cultural hub in the heart of Mexico City – to listen to the woman that they hope can bring about a radical change in Mexican society. Marichuy, as Patricio is commonly known, is an indigenous Nahua healer from the state of Jalisco in western Mexico. She was nominated by the National Indigenous Congress (CNI), a coalition of 58 indigenous groups, as their spokesperson to represent them in this year’s presidential campaigns. Gathering the 866,593 signatures – 1% of the average number of registered voters in each state – that independent candidates need to enter the race for president proved problematic for the CNI. Throughout their campaign for Marichuy’s candidacy, the congress argued that the mechanism for collecting signatures heavily discriminates against indigenous communities, which constitute the core of their support base. Signatures are provided via a National Electoral Institute app, but many living in indigenous communities do not own mobile phones, let alone devices which connect to the internet. In Mexico, internet users account for just 60% of the population, according to World Bank data. Marichuy was the first ever indigenous woman who attempted to stand as a candidate for the presidency, backed by the Zapatista Army of National Liberation (EZLN). This radical left-wing indigenous movement is famous for having led an uprising in southern Mexico that began on 1 January 1994, the day the North American Free Trade Agreement (NAFTA) with the US and Canada came into effect, arguing that this deal and economic neoliberalism would have a negative impact on indigenous communities. On stage in February, Marichuy was flanked by five indigenous councilwomen chosen by their communities to represent them in the CNI. This all-women line-up was remarkable in a country where sexism is widespread. There was a strong sense of indigenous pride at February’s rally, as each of the councilwomen, dressed in the brightly coloured traditional clothing of their own communities, began their speeches in their respective indigenous languages. Unlike many other CNI rallies held across the country over the last few months, most of this metropolitan crowd were non-indigenous Spanish-speaking Mexicans. As a sign of respect, they applauded these opening lines even though they did not understand them. According to government statistics, 21.5% of Mexico’s population self-identify as indigenous. Many of these communities are deeply dissatisfied with the current political and economic system in the country, which they see as benefiting a minority elite. In response, the CNI is proposing a new, anti-capitalist regime. The CNI accuses the private sector of theft. “The international companies are robbing us. They take our lands, our forests and our mines,” said councilwoman Reyna Cruz López at the rally. She is from Oaxaca, the state with the second-highest percentage of people living in poverty after Chiapas. A 2017 report from the UN Working Group on human rights and transnational companies confirms major human rights concerns in the context of large-scale mining, energy, construction, and tourism projects in Mexico. This report included examples of cases where the Mexican government and companies failed to comply with their obligation to ensure the participation of indigenous communities in projects which affect them. It mentions, for example, an expropriation order presented to an indigenous community in the State of Mexico in 2012 to build a motorway across their ancestral lands without prior consultation of the community. She talked about the 1997 Acteal Massacre, in which she lost nine family members. She was 10 years old when paramilitaries stormed her local church, murdering 45 indigenous tzotziles members of a pacifist political group. Councilwoman Magdalena García Durán also spoke from personal experience. In 2006, she was one of 207 people who were arrested in the town of San Salvador Atenco, about an hour northeast of Mexico City, during a protest against the expropriation of indigenous lands. “They beat us, they imprisoned us and they fabricated charges,” she told the crowd at the rally. García was released after 18 months, following a federal court’s finding that there was no evidence to justify her detention. The Inter-American Commission of Human Rights later found, in relation to the San Salvador Atenco case, that the Mexican government was responsible for illegal and arbitrary detentions, a failure to ensure judicial guarantees, torture and numerous rapes. The CNI proposes a more participatory form of government which works not just for indigenous communities but for all Mexicans. “We long for and believe that there are different ways of constructing power from below. A collective power in which everyone can participate,” said Marichuy, to applause in February. Aida works on cultural projects with indigenous communities in Mexico City. “I like the fact that they don’t want power just so that they can sit on the throne. They want the people to organise,” she told me. Most indigenous communities live in rural areas, but the councilwomen appeared keen to claim their relevance for urban audiences by insisting on a fundamental link between the city and countryside. “If the indigenous villages don’t plant beans and corn, the city will die of hunger,” insisted Francisca Álvarez Ortiz from the State of Mexico. Víctor, a philosophy student from Mexico City, agreed. “The indigenous communities are the ones feeding us,” he told me. But Álvarez’s claim hides an uncomfortable truth. In 2016, 65% of Mexico’s corn consumption came from imports, mainly from the US, and the corn production market in Mexico is dominated by two large companies – Gruma and Minsa. As the Zapatistas predicted, small-scale Mexican farmers have suffered as a result of NAFTA. They have been unable to compete with subsidised US corn producers on prices, and in the 10 years after the agreement was signed, US corn exports to Mexico increased by 323%. Corruption is another hot topic for the CNI. Transparency International’s 2017 annual corruptions perception index of 180 countries ranks Mexico as the 45th most corrupt country, with an equal score to Laos, Papua New Guinea, Paraguay and Russia. “We believe that in order to change the world we cannot be corrupt like the rest of them, like the politicians who pretend to represent us,” said Juan Villoro, a well-known writer and journalist who spoke at the February rally alongside the councilwomen. Whilst the councilwomen successfully articulated grievances of indigenous communities, the CNI did not release detailed policy proposals, and their campaign has not been without setbacks.